One of the funnier acronyms in computing is PBKAD. It stands for “person between keyboard and display.” Thus, it refers humorously to the weakest link in most troubleshooting scenarios. Like me, for instance, after installing the latest Insider Preview for Windows 10 (Build 18267). 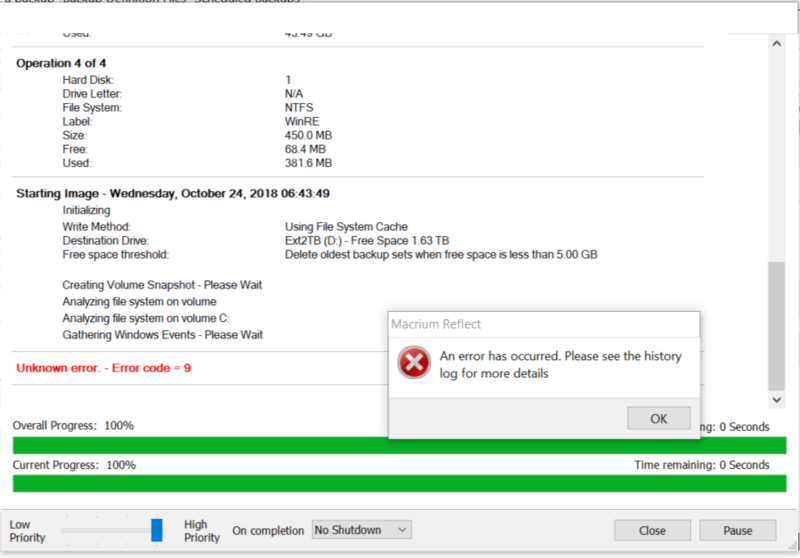 At first, I forgot that it’s necessary to re-apply the Macrium Reflect NTFS file system patch. Otherwise, you’ll see the infamous “Error 9” depicted below. But then, I grabbed the wrong patch (32-bit instead of 64-bit) and groused because it didn’t work. And that’s why I say operator error makes Insider Preview bug persist. Once I applied the right 64-bit patch, I could resume making image backups. Sheesh! This issue comes from a change MS made to NTFS back in Build 18234, and has persisted into every Insider Preview since. That turns out to be easy, actually. When I posted my issue to the TenForums community, other Win10 Gurus confirmed that my method was correct. They could only speculate I’d grabbed the wrong patch. When I downloaded and applied the right patch again, backup resumed working. Thus, it was obviously and completely a PBKAD problem. Yours truly really knows that a 64-bit patch is required to fix a 64-bit system. He just didn’t grab the right patch the first time he sought to apply it. Sigh. The moral of this story is that when things don’t work, check your work first and foremost. Sure, I could’ve gone through the motions again and figured things out eventually. But this escapade demonstrates another great value of the TenForums community. It’s a powerful force to counter the unavoidable if occasional impetus to do something stupid. And it sure helped me out of a jam this time, too. Here’s what I observed in my closing post on that thread. “Glad to have my backup working again. It’s even MORE important than usual on the Insider Preview test machines, because I (or somebody else’s software) blow them up pretty regularly.” Case closed, thank goodness!